1. Information on how to enter, Conditions of Entry 1 to 8 inclusive on the Entry Form and prize details form part of these Terms and Conditions. Entry into the Promotion is deemed acceptance of these Terms and Conditions. 2. The promoter is Brightlite Nominees Pty Ltd trading as Beacon Lighting, ABN 13 322 464 749 of 5 Bastow Place, Mulgrave Victoria 3170 (Promoter). Authorised under license permit number LTPS/17/16911. Entry is open to all Australian residents who are 18 years of age or over (Eligible Entrants). Directors, management and employees of the promoter and their immediate families, suppliers, associated companies and agencies are not eligible to enter. 3. 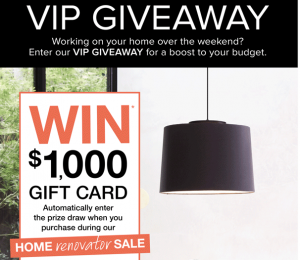 Entrants must sign up as a Beacon VIP to enter the draw. Beacon VIP membership is free to join. As a VIP you automatically agreed to receive marketing communications from Beacon including emails, SMS and direct mail. The 10% off globes always discount is off Beacon Lighting’s RRP prices and is available for in-store globe purchases only. Cannot be used in conjunction with any other offer. The competition is open to new Beacon VIPs as well as existing Beacon VIPs. 4. To enter, an eligible entrant must make a purchase in store or online between Monday 15th April to Sunday 28th April 2019. Only one entry per eligible entrant is accepted. 5. The prize is not transferable, exchangeable or redeemable for cash. 6. The prize draw will take place at Beacon Lighting Store Support, 5 Bastow Place Mulgrave VIC. The prize will be drawn by Wednesday 1st May 2019. The winners will be notified where practicable by email and/or by telephone on the day of the draw but no later than five business days. 7. The grand prize is a $1,000.00 Beacon gift card. There will also be runners-up prizes of 4 x $250 Beacon gift cards. 8. If any prize is not claimed within 3 months of the date of the draw, the promoter will conduct a further draw on Thursday 1st August 2019. The winner of any further draw will be notified by mail and telephone. The entire prize value must be claimed within 3 months of draw date. 9. The Promoter’s decision in relation to any aspect of the competition is final and binding on each person who enters. No correspondence will be entered into. No responsibility is accepted for late, lost or misdirected entries. 10. To the extent permitted by law, the Promoter shall not be liable for any loss or damage whatsoever (including but not limited to direct or consequential loss) or personal injury suffered or sustained in connection with the prize[s]. The promoter accepts no responsibility for any tax liabilities that may arise from winning a prize.